I posted the image on the left a while back, here on this blog. The image on the right, a reverse-glass painting, is from our collection. I did a copy of this work, in the same technique, for an exhibition at the gallery I exhibit at in Wellington, 2009. I don't think many people looked at it, understood the complexity of the technique, nor the symbolism of the imagery. 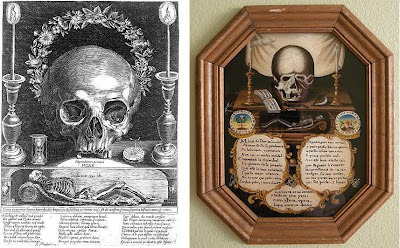 I've been collecting examples of this particular Momento Mori image since 2006. They're easy to find in reproduction, but hard to find originals. Both works below are dated mid 18th century. The title of the etching on the left is translated as 'An Aspect Of The Story Of The Legend'. The text under the skull is more direct, stating 'The Wages Of Sin Is Death'. I've decided to exhibit the reverse-glass painted work with my work, Reloj de Recesion at Blackbird Studios in Las Vegas for their Dia De Los Muertos exhibition opening on the 4th, as I want to show my influences, not pass off the work I do as 'original', which is such a silly Modernist notion anyway. The devotional work I do always has to have a source to be able to pinpoint the dedication. Good artists and good work just doesn't fall out of the sky. Everything has a lineage. I also want to write more about the reverse-glass painting technique as it's such an interesting process, mostly of the mind because everything in the process of painting is reversed, which really reinforces Leonardo Da Vinci's statement on how painting is an activity of the mind. I think it would also be good to discuss in regards to New Zealand painting, as an artist who borrows this technique, recently won the Wallace Art Award.